When we grow plants, we give them what they need to grow and be successful: sunlight, water, supports, fertilizer, and other nutrients. If they are having trouble growing, we look to see what else they may need or what we need to change. We don’t blame them when they fail. Instead we look at what we need to change. Hurting the plant or putting it away and ignoring would be pointless. We look to what we can change to help the plant thrive. 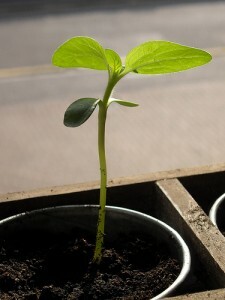 Our success as a gardener is dependent upon whether or not the plant is thriving. Growing children is not so different. Punishing them doesn’t help them to be better. Hitting only hurts them and our relationship. Putting them away in time out doesn’t address the situation or help them to be better. Growing children have needs that must be met: sunlight, water, nutrients, support, and love. When their needs are met, they thrive and we get to watch them develop and unfurl into the wonderful people they are. If there is a problem, rather than blaming the child and punishing him, we need to look at what needs are not being met and work with him to help him grow. As much as I love this idea, some plants benefit from pruning and pinching to help them grow strong, tall, full and vigorous. I think that is a useful addition to your metaphor. A garden needs a firm, loving hand to flourish, just as children need firm, loving parents. Thank you for helping me to see that sometimes it is okay for me to be stronger with my child, while remaining gentle and nurturing! I remember looking at the plants on my balcony last summer during a hot week when we had been busy. They hadn’t had enough water. I thought, “yep, that’s just how I feel”. So I enjoyed reading this and relate to the comparison. Also, as Mary says, plants benefit from varying treatment. There are many different plants with many different needs. Each child is unique. A daisy and a mountain orchid are both beautiful, tough plants but you won’t find them in the same conditions. Learning and then creating the best conditions for each little person is surely one of the keys to great parenting. Thank you for a great, though provoking article.